In order for the descendants of fish to become creatures that could walk on land, fingers and toes had to replace long, elegant fin rays. Scientists have now shown that the same cells that make fin rays in fish play a central role in forming the fingers and toes of four-legged creatures. “When I first saw these results you could have knocked me over with a feather,” says Neil Shubin, professor of organismal biology and anatomy at the University of Chicago. “For years scientists have thought that fin rays were completely unrelated to fingers and toes, utterly dissimilar because one kind of bone is initially formed out of cartilage and the other is formed in simple connective tissue. Our results change that whole idea. We now have a lot of things to rethink.” The findings appear in the journal Nature. 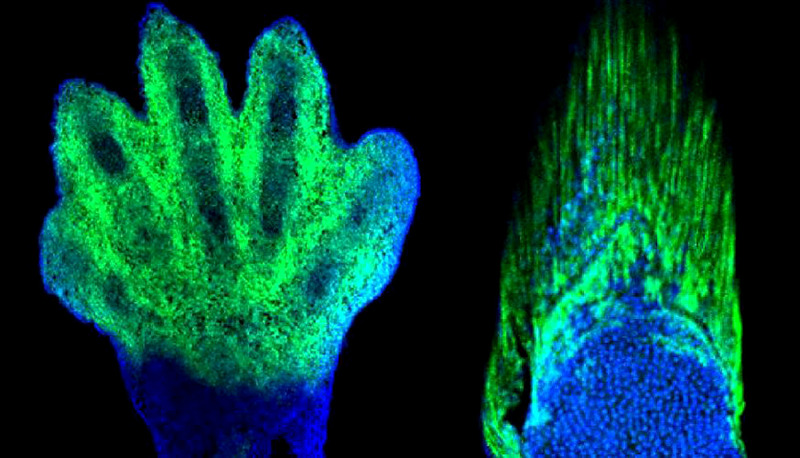 To unravel how fins might have transformed into wrists and fingers, researchers worked mostly with a standard fish model: the zebrafish. Tetsuya Nakamura, a postdoctoral scholar in Shubin’s lab, used a gene-editing technique, CRISPR/Cas, in zebrafish to delete important genes linked to limb-building, and then selectively bred zebrafish with multiple targeted deletions. He spent more than two years building and cross breeding the fish mutants, a project that began at the Marine Biological Laboratory in Woods Hole, Massachusetts, which provided research support and summer lab facilities. They studied the development of cells, beginning, in some experiments, soon after fertilization, and followed them as they became part of an adult fin. Previous work has shown that when Hox genes, specifically those related to the wrists and digits of mice (HoxD and HoxA), were deleted, the mice didn’t develop those structures. When Nakamura deleted those same genes in zebrafish, the long fins rays were greatly reduced. “It really took the combination of labeling and knockouts to convince us that this cellular relationship between fins and limbs was real,” Gehrke says. The Japan Society for the Promotion of Science Postdoctoral Research Fellowship, the Uehara Memorial Foundation Research Fellowship, the Marine Biological Laboratory, the National Institutes of Health, the National Science Foundation, the Brinson Foundation, and the University of Chicago funded the work.